In Part 2 of this 3-part series we’ll cover a topic called Prospect Theory. This theory essentially builds on behavioral finance and dives even deeper into the psychology of why people tend not to think as rational as it would seem regarding choice. Prospect Theory, along with a series of studies that provided evidence of irrational behavior, turned traditional wisdom on its head. Traditionally, expected utility theory has been the descriptive model used to describe decision making under risk, or choices that have uncertain outcomes. However, in 1979 two psychologists, Kahneman and Tversky, presented a criticue of this theory and developed an alternative model – Prospect Theory. Conventional wisdom, using expected utility theory, stated the net effect of gains and losses involved with each choice are combined by an individual into an overall evaluation as to whether the choice is desirable or not. “Utility” is a term to define the enjoyment one receives from a decision and expected utility theory argues that people prefer choices that maximize utility. In other words, the value of our choices is dependent on the final outcome, or overall valuation, rather than individual components such as gains or losses. — TvedeI’ll give you a minute to decide which choice you would pick for each scenario. So which one was it? There really isn’t one right answer for either scenario, but if you chose option B for both scenarios you would be considered more risk averse than someone choosing A. If all the subjects would have answered both rationally and logically, they would have chosen either A or B for both scenarios; However, the overwhelming majority of subjects in the study chose choice B for scenario 1 and A for scenario 2. Meaning they were willing to settle for reasonable gains, but more likely to exhibit much riskier behavior to limit losses. This would seem to prove the hypothesis that losses are weighted more heavily than an equal amount of gains. So we’ve seen behavioral finance and prospect theory attempt to provide insight into the decision making process and demonstrate the joy of gains is not equivalent to the grief of losses. This type of behavior is actually on display throughout our financial decisions as well. In fact, it’s the simple reason why most people are not willing to save their money and invest – future gains offer much less joy than the temporary pain of not having the newest items. Unfortunately, it’s also heavily prevalent in investor’s behavior as well, especially selling patterns. Consider the disposition effect, the tendency for investors to hold onto losing stocks for too long and sell winning stocks too soon. If we look back to the subjects in the study we see this effect clearly explained as they were very willing to accept reasonable gains but much less willing to take a loss. Determining a fair value range for each of your investments as well as knowing when and why to sell are particularly important. In fact, after this series I’ll write an article detailing just that. 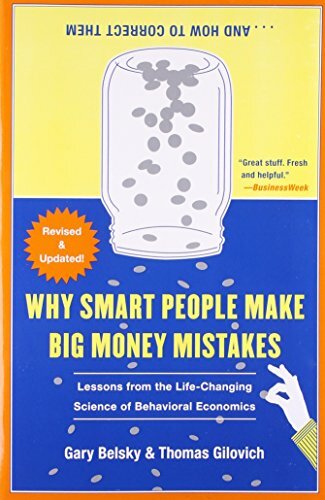 The above quote feels like it would come straight out of Benjamin Graham’s The Intelligent Investor, yet it actually comes from a book on behavioral economic titled Why Smart People Make Big Money Mistakes. The point being behavioral finance and prospect theory offer similar lessons that Ben Graham preached long ago. Approach investing with as little emotion in the game as possible and stick to a businesslike philosophy to elude potential traps and biases. Speaking of traps and biases… I’ll discuss how to identify and avoid them in the final part of this series.